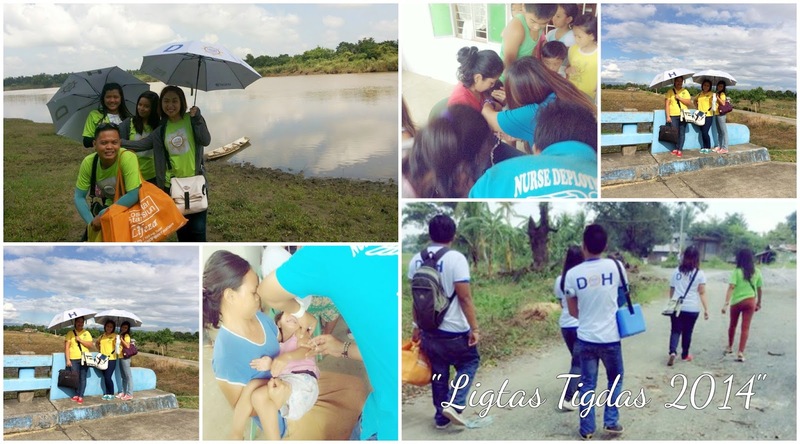 September had been a busy month not only for us NDPs but also to the entire staff of the Rural Health Unit because of the month-long activity of DOH dubbed as “Ligtas sa Tigdas.” This said activity aimed to cover children aged 0-59 months. As early as September 1st, we already roamed around the high risk zones in order to monitor whether the vaccination team missed a child or not. We also encoded in our database all the names of vaccinated children, with proper remarks if needed, then promptly submitted the reports to concerned people/offices. During the mid of the campaign, we assisted the vaccination teams in order to improve the MR-OPV coverage in our municipality. We also helped them in tracking missed children whenever possible. The last few days of this month had been spent in doing our Rapid Coverage Assessment (RCA) wherein we randomly checked twenty households in both high risk and non-high risk zones of different barangays. I learned how important it is to have division of labor in campaigns like this. There should also be clear guidelines about each other’s job and everyone must be aware of each other’s scope and limitations. This way, everyone could focus and make use of their time more efficiently; wrong delegation of work won’t happen and most importantly, no one would get exploited. I also learned that merely getting the job done is not enough to say that an activity succeeded. Success must be based on the outcome of the activity. Patience, cooperation and dedication must be given by everybody. Travelling to different barangays during our RCAs had been hard not only because those areas are far but also because we had to shell out travel expenses from our own pockets. Another thing is, we encountered parents who refused to have their children vaccinated because, as verbalized by them, their pediatrician told them so. Others said they don’t want to have their children to get hurt and some just don’t have time to go to vaccination posts. It would be nice if NDPs would get a travel expense allowance for their RCA, if feasible. This would not only help them reach far-flung areas but also motivate them to continue working hard. Coordinate with private practitioners, if not already, regarding DOH campaigns so they could advise their clients to cooperate as well. Also, we should intensify information dissemination via visuals or print ads so everyone gets to know the importance of getting vaccinated. You see, what we do requires a lot of patience and stamina. Our team had to walk under the blazing heat of the sun (or under the pouring rain) in each barangays in order to vaccinate children that were missed during the scheduled immunization in their area. Boundaries to boundaries, bawat eskinita o kahit gitnang bukid, we still continue despite exhaustion. We could only hope that people get to appreciate what we do and that all of these would pay off someday.